Swedish power/ progressive metal band Evergrey have always been a forward thinking, emotionally connected group. Their music embodies the crest of beauty and aggression, tenderness and power – using the versatility of their creativity, instruments and influences to paint broad stroke masterpieces. So much so that their second album Solitude Dominance Tragedy remains a top five all-time effort in this scribe’s catalog of metal records. While members have come and gone, the base of Evergrey remains creating timeless compositions, intent on reaching the mind, body, and soul for eternal engagement. The Atlantic as the eleventh studio album is this quintet’s third together – and it’s easy to hear that these musicians genuinely enjoy the labor and effort they put forth to continually level up the hooks, the melodies, the dynamics, and the contrasts for an outstanding product. The first single “A Silent Arc” starts surprisingly calm before a crescendo of double bass-led drums and guitar/bass pounding takes things into an extreme edge veneer – the almost eight-minute opener a signal for the band’s always impressive understanding of progressive ideas put into lighter and heavier angles. Henrik Danhage and Tom Englund as guitarists circle everything from Scandinavian death/black nuances to North American power angles a la Nevermore, while bassist Johan Niemann gains a bigger presence through his thick bottom end action that propels many aspects of the record into this multi-faceted aural vortex of alternate thought patterns. It’s hard not to be jumping, swaying, or bouncing along to the musical hooks throughout “Weightless” and “Currents” – beyond the fact that the premiere vocal delivery of Tom carries the verses to the depth of your soul, while the choruses command deeper resonance that doesn’t subside even after initial exposure. Breathtaking soloing, intriguing Moog-keyboard use from Rikard Zander on the instrumental “The Tidal” plus the semi-staccato leaning “A Secret Atlantis”, and the band’s ability to reach into your heart and shake things up during the ballad “Departure” are one of a kind – knowing when to turn arrangements on a dime, stripping instruments to their barebones to build things back up. It’s a record with personal meaning to the band as well – the collapse of a long-term relationship for Tom is not easy to delivery in conventional songs, but he certainly comes to terms in a way that the audiences can connect to based on their own personal relationships and situations they’ve gone through. Veteran musicians usually don’t tap into a well of urgency and vibrancy quite like Evergrey continues to accomplish. They are masters at adding the right narrative/sound effect ratio without overtaking the natural themes the band wants to put across – and smartly balancing out their self-production abilities with the mixing excellence of Jacob Hansen, The Atlantic sways the seas of victory. 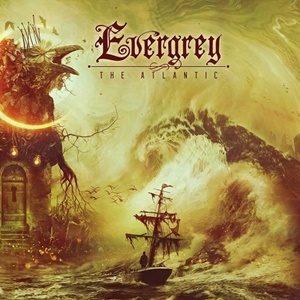 When looking at the discography of Evergrey, The Atlantic has that balance of what the band has been steering into with their last two albums Hymns for the Broken and The Storm Within while reaching back for the occasional hint of the aggression and extreme dynamics that helped The Dark Discovery and Solitude Dominance Tragedy become benchmarks. Raise a glass to one of the best power/progressive metal bands in the world.